The Irlen method is used to help individuals who have Irlen syndrome, also called Scotopic Sensitivity Syndrome. It is a perceptual processing disorder, a problem with the brain’s ability to process visual information. It is not an optical problem. The Irlen method uses coloured overlays or coloured lenses that filter out the offending colour so that the brain can process visual information optimally. 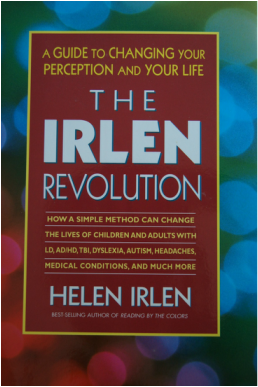 Irlen Syndrome is called after Helen L. Irlen who is an internationally recognized educator, researcher, therapist, scholar, and expert in the area of visual-perceptual problems. Her background includes Assistant Professor of Adult Learning Disabilities at California State University/Long Beach, instructor in psychology at Cornell University, research assistant at Cornell, and more. Individuals experiencing Irlen Syndrome may present with one or more of the following symptoms: difficulties with reading in general, slow reading, reading but not comprehending, poor fluency, letters that are floating or wriggling, difficulty memorizing words for spelling, taking considerable time to do a task compared to peers, and more.